Blue flag grows from 60 to 90 centimetres tall at maturity. Several showy, purple-blue blooms appear from the end of May to early July. The flowers can be up to 10 cm across and have three showy sepals that gracefully curve down (or flop over, depending on your point of view). They have a splash of white and yellow near the centre and purple veins that probably guide pollinating insects to the food within. There are three paler petals nearer the centre, which are stiffly upright. Several large seeds are formed inside a large brown capsule. Blue flag leaves are long and lance-shaped, like prehistoric grass, sometimes up to 3 cm wide and 80 cm tall. Range: Blue flag is our most widespread native iris. It is found from southern Manitoba eastward into the Atlantic provinces. Habitat: The Blue flag grows in wet areas of woods and meadows and along shorelines of lakes, rivers and ponds — to the delight of cottagers and canoeists. The blooms, containing nectar and pollen, attract pollinators such as hummingbirds, as well as bumblebees, butterflies, moths and other insects. Blue flag also serves as a source of shelter for animals that live along shorelines. The iris has been admired for centuries. Mythologies of cultures from around the world refer to it. Modern-day interest in the iris is evident through its popularity in gardens everywhere and in the number of societies formed around this plant. There is even an iris on Quebec’s flag — the fleur-de-lis. Although supposedly a European species of iris, it seems many people now associate this symbol with the native blue flag iris. Blue flag (Iris versicolor), also known as blue wild iris, American fleur-de-lis and water flag, is our most widespread native iris. It is found from southern Manitoba eastward into the Atlantic provinces. It grows in wet areas of woods and meadows and along shorelines of lakes, rivers and ponds — to the delight of cottagers and canoeists. 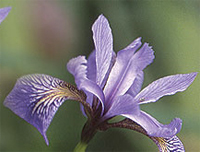 Under the right conditions, this iris can also be planted in an ordinary garden to lend an air of elegance. Because it is less attractive to deer than many other plants, it is a relatively safe addition for country gardens as well. Although the rhizomes of blue flag are highly toxic, Aboriginal people have used the plant to alleviate a wide variety of ailments, including vomiting and constipation. The leaves have also been used for weaving baskets and mats, according to authors Doug Bennet and Tim Tiner in their book Up North Again. Blue flag is a perennial that spreads by its fleshy rhizomes. You can divide it in the fall to speed up the process or to share it with a friend. You can also start new plants by seed — sow them in the autumn and cover with about 1 cm of soil. If successful, you will see shoots in the spring and flowering plants the following year. You can also start the seeds indoors at the end of winter. Keep the seeds in the freezer for a few weeks before planting and, in the spring, gradually harden off the seedlings in either a cold frame or another sheltered spot. Grow blue flag in sun or partial shade and keep its roots moist by placing it in a damp area or a well-mulched garden or submerging it in the shallows of a pond.